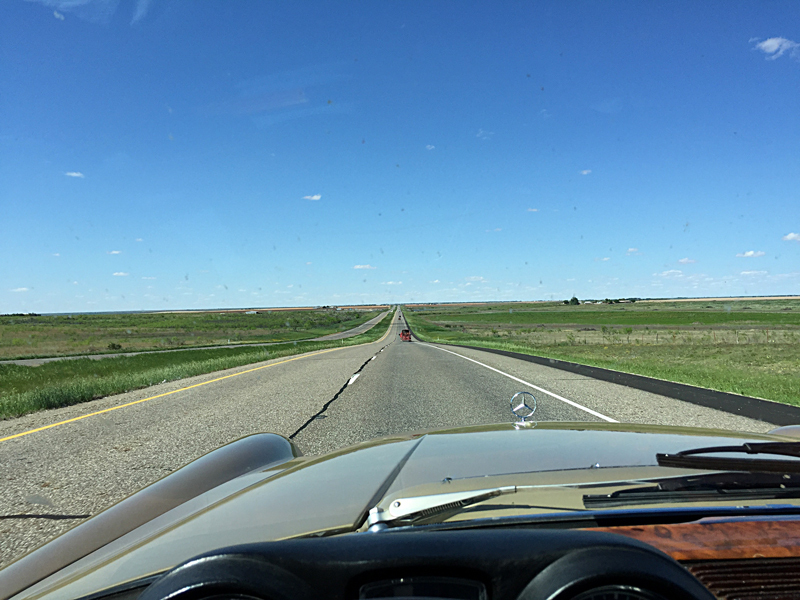 Texas to Oregon in a classic Mercedes 280se Coupe: Day 2, Comanche, to Lubbock, Texas. I have an odd compulsion when it comes to road trips; I prefer to take roads I’ve never traveled. I have a great visual memory, as well as an old Rand-McNally Road Atlas with every road I have ever driven highlighted. I left the atlas at home this trip, but I know this part of the world well enough to know the roads by memory. Looking at the possible ways to continue, with the goal of going to Santa Fe, New Mexico, I see that just about every route possible is one I have driven before. Looking a bit west I see we can take a roundabout way: US highways 67 and 87, linking them together in San Angelo, TX. We slept in a bit, and get a slow start due to last night’s late finish. Testa Rossa wants to stop again in Brownwood for a few last trips down memory lane. I noted in the daylight the bug-splattered nose of the Coupe, and decide to hit a car wash while she’s doing all that. The species of bug that we killed by the thousands as we left the Gulf Coast has a reputation for damaging car finishes if left on too long, so I want to get them all off ASAP. We finally get underway and begin our not-so-direct route. Clearly Santa Fe is out of the question for our destination, so we scale it back to Lubbock, which should be an easy, relaxed drive. If I were in any other car, I’d be willing to push distances and average speeds out further, but I really don’t know this car. I don’t own this car. Before yesterday I’d driven it maybe about forty-five minutes total. Why push it? 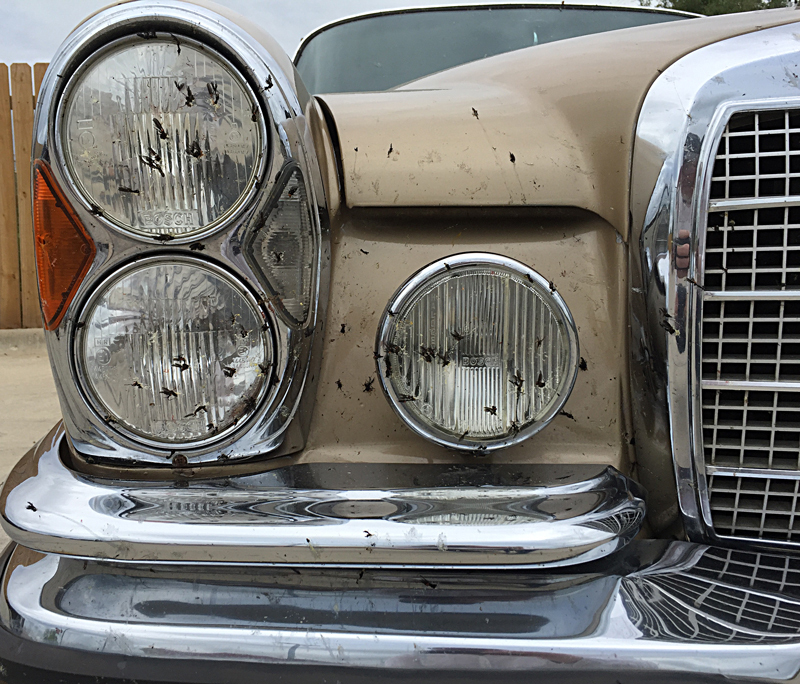 Designed by the legendary Paul Bracq, the car is a 1971 280se Coupe. Based on the W111 chassis, and mated to the M116 engine it is the descendant of the venerable Mercedes-Benz luxury touring cars from the mid-twentieth century, and the predecessor of the S-class which began in 1972 and continues to this day. The intention was to build a high-quality luxury car, with power, comfort, and focus on space for two people. This is NOT a sports car. It is big, powerful, and luxurious. This particular car is quite nice. Very comfortable seats, and best of all for driving in Texas, a functioning, original factory-option air conditioning system. We made use of it all day yesterday as we left Houston and drove through the heat of central Texas. We are making use of it on and off today as well. Especially as our west- and north-bound routes has me on the sunny side of the car all day. When I first drove the car about five years ago, the steering was a tad vague, but since then my father’s preferred shop, Eurocar-Werke has fixed that, along with several other minor issues to make the car a great driver. It is hard to give you an objective summary of the car’s ride and handling as two factors are impacting it in a way that prevents me from getting a good understanding; weather and load. The weather has been clear, but very windy. Gusty winds, mostly from the side, which makes getting a feel for the car difficult. Also the trunk and back seat are loaded with items. Not just our luggage, but boxes and bags of items my mother chose to give us. My parents are moving to a much smaller aprtment later this year, so they are trying to pare down possessions, and as a good son, I’ll do anything I can to help out. If the rear looks a little saggy in photos, this is the reason why. As soon as I can enjoy the car without these encumbrances I’ll write a solid review. Meanwhile, the best description I can give is “Comfortable.” This is a very comfortable car, and I’m beginning to appreciate the love my parents have for this fine example of German engineering and craftmanship. 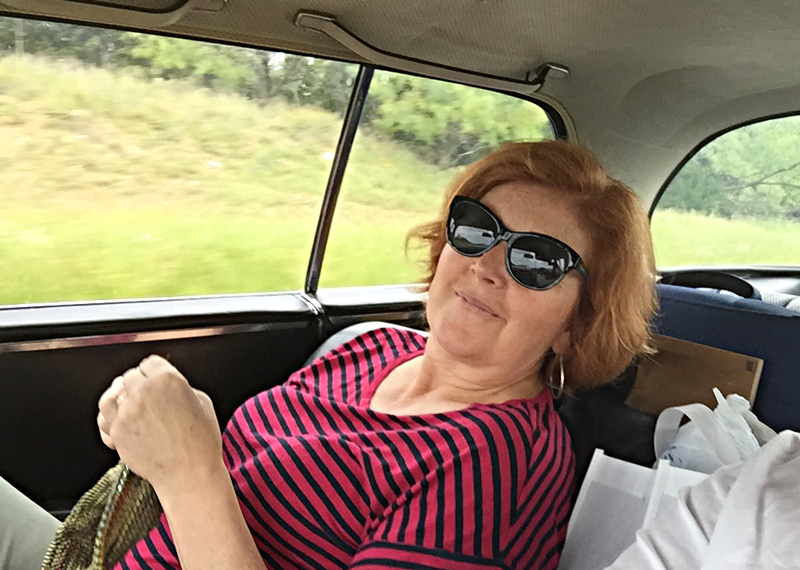 My traveling companion is an amazing woman. She has achieved much in her life; an advanced scientific/medical degree, built and ran a very successful business, and subsequently sold that business to make for herself a comfortable retirement. She’s wicked smart, and can talk about anything to anyone, making them feel like they are the most important person in the room. I like to say that she is the fully realized product of feminism: Equal to just about every man in terms of intellect and achievement, yet still very much a woman who cultivates and presents her femininity rather than suppressing it. So here she is, reclining in this comfortable car, and knitting. She loves to knit. She approaches knitting with a scientic mind, writing out algebraic formulas of what she wants to create on paper, and then grabs her needles and yarn and gets to work. Once the pattern is established, she loses herself in the rhythm of the project. She tells me that she has never been able to knit in any car until this one, which is a great maesure of the comfort of the Coupe’s ride. In San Angelo we turn north on US 87 and the landscape flattens, and the trees become sparse. “Think this is flat yet?” I ask, and then always follow up with “It still isn’t as flat as Lubbock… trust me.” We roll stealthily onto the Llano Estacado without ascending the Caprock Escarpment due to our southerly approach from the Edwards Plateau, so the transition is subtle. having spent four years in this region I know it when we have arrived though. As we roll towards Lubbock I reminisce about my student days there for Testa Rossa, who attended graduate school at rival Texas A&M in the opposite corner of the state. Lubbock was a “dry” town back then, still a holdout of the bad old days of Prohibition. Ironically you could buy alcohol by the drink in dining establishments, but to buy it in any volume you had to drive out of town. I point out the the vestigal remnants of “the strip”, the place on the city limits on US 87 where all the giant drive-through liquor stores existed back then (only one remains now thirty-some years later.) We go into town and I give her a quick tour of the campus, places I lived, and various landmarks, before we head to our hotel, and then out to dinner. It is a nice, short day wrapped up with a nice meal and drinks. 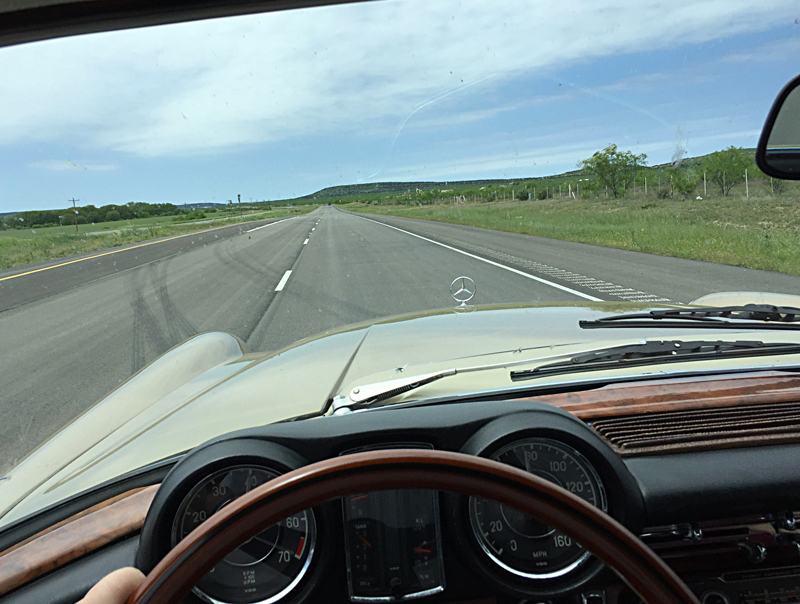 Previous Previous post: Texas to Oregon in a classic Mercedes 280se Coupe: Day 1, Houston to Comanche, Texas.